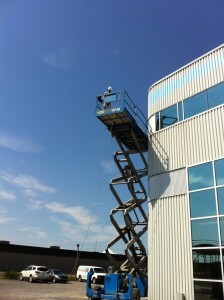 Our painters are often asked to paint at heights on 2, 3, or even 4-stories buildings. Before we sign a contract, most clients want to know what methods we plan on using to proceed with their painting project. And what about safety? 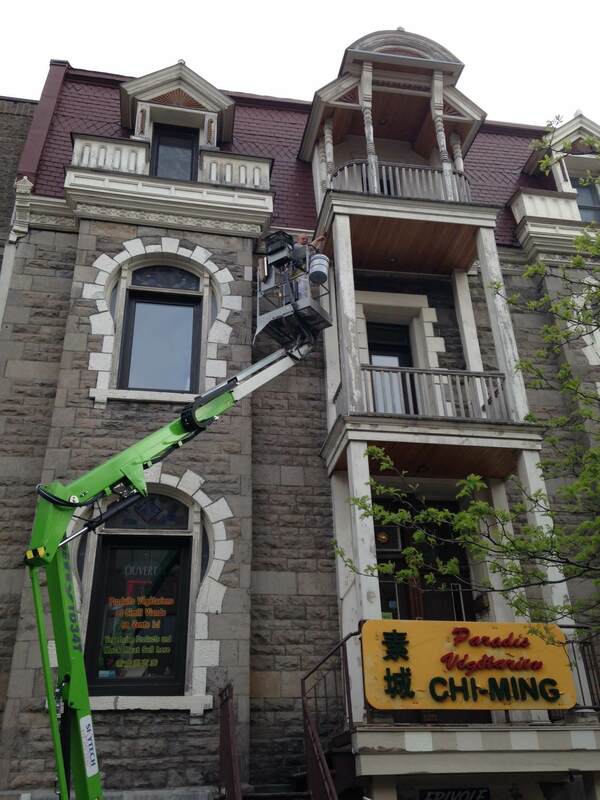 In Montreal, we can easily find 32-feet long ladders in any hardware store. But Findecor painting company does not use often those traditional ladders, because we prefer safer tools (the risk of accidental fall is high when painting with a ladder). Moreover, the use of ladders is not the most efficient way to do it as one needs to move the ladder very often to paint a wall. Also called aerial basket or cherry picker, the lift we use is very useful for painting at heights. We can go up to 40 feet with the lift we own. Moreover, with some models the painter can move the lift sideways without having to down on the ground each time. This helps our painters increase their painting speed thus respecting easier the delays. In order to carry out painting at heights tasks, we proceed most of the time with one or several platform lifts. Also called scissors lift, the platform lift has the advantage of being able to contain 2 or 3 painters at the time. We frequently rent two platform lifts that have a length of 8 and 12 feet respectively. Not only does this allow us to finish a painting project much soon, it also helps reducing the risk of falling. According to the CSST recommendations, a painting contractor should proceed to the inspection of each platform daily. We are aware that when the inspection of our equipment is not done regularly, it could lead to dangerous consequences. There have been serious injuries and even some deadly falls in the province of Quebec due to this negligence. That explains why our painting company takes the inspections seriously. Proceeding the inspection of lifts and aerial platforms is not the only mandatory procedure: it’s also essential to always wear a helmet and a safety harness. 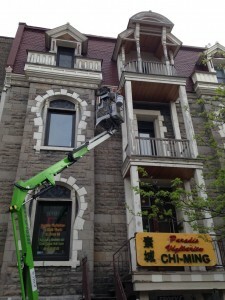 Wearing a safety harness is mandatory for all painters when they are painting at heights. In the construction painting field, the harness is made of vinyl, and it needs to be replaced each time a paint drop falls on it, or else we have to pay a CCQ fine. Law is severe, but it’s only because the government heard of a lot of accidents that could have been avoided if those painters had used a standard safety harness. For any questions or comments, please feel free to ask us.